We will take you to Mariki, starting point of your Wampu river rafting experience. This Wampu river rafting trip is a fascinating adventure with many grade 2 rapids.You will make the rafting with local guides. The trip takes about 4 hours down the Wampu river. Minimum age is ca. 10 years. 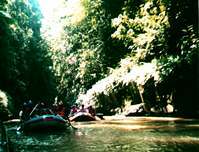 You will enjoy the beautiful nature, sailing on a wide jungle river in the midst of unspoiled impressive huge rainforest. All around you can see and hear the tropical wildlife. Half way we will make a stop at a waterfall where you can take a fresh shower and lunch in the open air. Lunch is included. 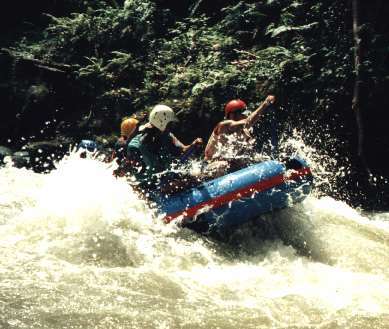 After lunch you will continue the rafting for about 2 hours until the bridge of the Bohorok river.